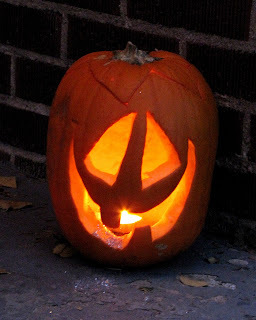 Ordinary Life Magic: trick or treat!! 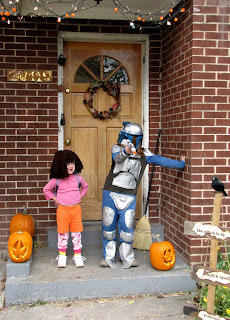 I was up at six something finishing up Maddie's costume. Not out of any panic, mind you -- actually I was loving it. It was a very warm day - one more day of seventy degrees. 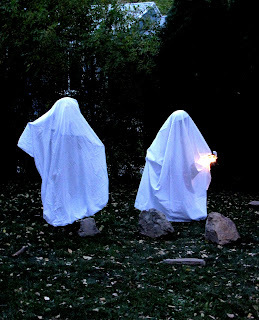 Which invited us to spend the day outside- putting up our ghosts (if we put them up too soon, the wind knocks them over again and again, and I get tired of them), getting pictures taken, chasing and terrorizing wearing our paper masks. Eventually it came time to be off. It was such a beautiful night. 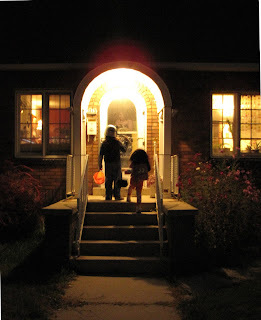 Our city neighborhood isn't one of those "kids running everywhere" sort of neighborhoods. I don't think we ran into any more than five or six families. 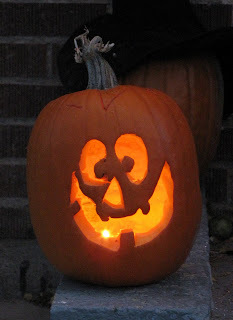 But I love seeing the little ghouls shooting across the street way up ahead, barely visible under the streetlight. The warm air was balm for my spirit. Hearing the swoosh of the leaves as we brushed by - and the crackle as they came underfoot enchanted me. 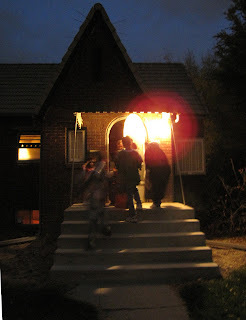 Seeing the children waiting in anticipation under the glowing golden lights on the front porch made my heart smile. 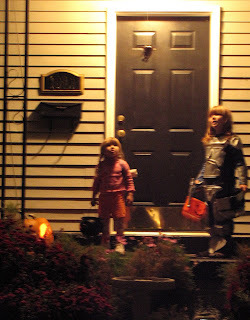 And finally, walking home, in a gentle, warm rain, tugging a wagon filled with twenty pounds of candy and two tuckered out babes made me appreciate that there are still days when children can be anything -monstrous or magical. 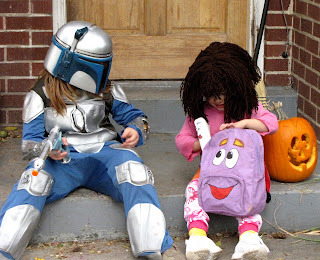 I'm sure you are aware, but I want to say that your Dora costume is way better than anything you can buy. I kept thinking "why on earth would I buy plastic when I can make the thing for practically free?!?" The yarn cost me $2. The yellow socks I bought in a package - but she needed the next size up, anyway. White tennies - also needed. Backpack? - every kid has one of those Dr. Seuss packs that come with the book club membership - I painted ours. She'll play with it often, I am sure. Map? Painted a rolled up piece of foam. Had wooden beads ready to paint. Shorts - bought those yesterday morning on clearance for $1.50. Which was good - :), because Trev's cost a fortune. But worth it. 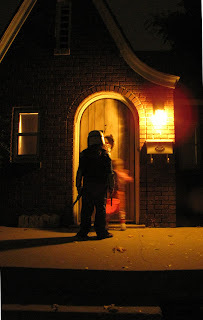 Great photos...sounds like a magical Halloween.